Looking for a quality Bluetooth speaker that sounds good, supports the latest tech and isn’t super expensive? Well, the team over at iClever sent me several of their gadgets to test out and the one I’m probably most impressed with is the Bluetooth wireless speaker. It should be noted that I have been given a review unit by iClever, but this is not a sponsored post nor have I been paid to write it. I will list out the pluses and minuses of the device and give my general opinion based on my own usage. The exact model I am reviewing is the iClever Bluetooth IC-BTS02 speaker. If you own one of these and have anything to add, feel free to leave a comment. Now let’s review it! The first thing that struck me about the speaker was the size. It’s a tiny little speaker that fits easily into your hand. It was also small enough to fit into my jacket pocket, which was convenient when I took it for walks in the forest with my kids. The exact size is 2.75 inches tall by 2.5 inches (length & width). For review purposes, the size will make it very easy to take with you anywhere. The other big plus is that it looks really nice. It’s all black with a blue band through the center. The sides have some kind of glossy surface, which makes it a bit shiny. The only problem with the glossy sides is that your fingerprints remain on the unit and you will need to constantly clean it if you have oily or clammy hands. The speaker is on the top of the unit, so all the sound comes out from there. On the front of the unit is one button, which controls Bluetooth and phone calls. If we flip the unit over, you’ll see the rest of the controls. You have three buttons to control music and volume. In addition, you have an On/Off switch, which helps save battery life. In terms of weight, the unit is definitely less than a pound. According to the documentation, it’s close to 9 ounces. The only other small issue I noticed in terms of design is that the bottom uses a rubber material, which collects a lot of dust and dirt. Luckily, you can just take a wet paper towel and wipe it to clean it off. So what can this little speaker do? Well, it’s main function is to connect to any device that supports Bluetooth and act as an external speaker. When I got the speaker, I wanted to see if I could set it up without having to read the instructions. That’s usually my test on how intuitive a company makes their products. After flipping the switch to On, I figured I would have to press and hold the button on the front to enter pairing mode. Thankfully, that’s exactly how it works. The button will begin to flash and then you can go to your tablet/smartphone/device and connect to the speaker. 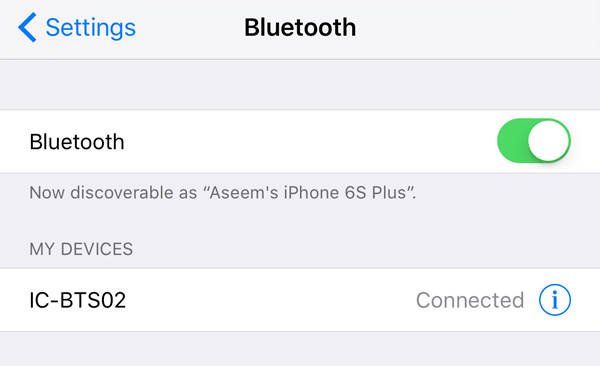 Above, I connected the speaker to my iPhone 6S Plus by simply tapping on it. The nice thing about the speaker is that you don’t need to type in any password or anything else to connect via Bluetooth. Once connected, audio from your device will now come through the speaker. Depending on your device and what level of Bluetooth it supports, all audio may be routed through the device. For example, when using my Nexus 6 and iPhone 6S Plus, every sound generated on the phone was piped through to the speaker. This included all audio from any app that I used, phone calls, FaceTime calls, music, etc. In addition, on any kind of call, you have to talk to the speaker and not your phone. The speaker has a built-in mic and the speaker on the phone would deactivate automatically when connected to the Bluetooth speaker. This actually works out well because you can listen and talk directly to the speaker rather than having to talk into your phone and listen via the speaker. I was able to leave my phone on my desk and walk around the house with the speaker while on a phone call. Obviously, you can just do that with your phone too, but this speaker is definitely louder than a phone speaker. The only downside here is that you have to keep the speaker within about 2 feet of your face, otherwise no one can hear you clearly. In terms of specs, the speaker supports Bluetooth version 4.0, A2Dp, AVRCP, HFE and HFP. It’s also worth noting that you can only connect one device to the speaker at a time. Once connected to a device, it will automatically reconnect to that device when you turn the speaker back on. If you do not use the speaker for a certain amount of time (15 minutes), it will automatically power off, which is definitely a required feature for a device of this type. However, this only occurs when the device is on, but not paired with any other device. If you leave it on and it remains paired to your phone, etc., then it seems to remain on and the battery will run out much faster. Luckily, the buttons on the bottom are also designed intuitively. For example, if you are listening to music and you press the next song button, it will load the next song. However, that button is also the increase volume button. Well, I tried holding down the button instead of just pressing it and sure enough, I started hearing beeps and the volume getting louder. In terms of the battery, which is a 500mAh lithium-polymer battery, the device lasts a surprisingly long time. I wasn’t able to test it from full charge to dead while continuously playing music, but the device lasted for several days on one charge with a few hours of usage per day. It should be noted that I always turned the device off manually when I was not using it. In terms of charging, the battery takes several hours to charge, which is to be expected. The speaker comes with a USB to micro-USB cable, which you can connect to your computer for charging. You can also just purchase a power adapter if you want to charge it faster from a wall outlet. Other useful features include the Line-in or AUX port on the back. If you have a music player or want audio piped from a device that doesn’t support Bluetooth, but has a 3.5 mm audio jack, then this feature comes in really handy. Lastly, but not to be forgotten, is the sound quality! Obviously, when you’re spending $25 for something, it’s not going to blow you away like a Bose speaker would, but it’s also not costing you a fortune. The speaker has a 5W driver, which delivers pretty decent sound for such a tiny little device. I was quite impressed with the quality of the sound overall. According to the manual, the frequency range is 90Hz to 18Khz, which sounds about accurate. Depending on what kind of music you listen to, the sound quality will vary. For example, music with a lot of highs sounds excellent, but music with more mids doesn’t sound as good. The bass is good, but obviously with any speaker of this size, you’ll get some of that “muddied” sound. Outside of that issue, the speaker is VERY loud. I blasted this thing at full volume on the speaker and on my phone and I literally had to step away because it was hurting my ears. The sound was also not as distorted as I thought it would be at such a high volume. Overall, I would give this Bluetooth speaker a 9 out of 10 when comparing it to other similarly-priced speakers. The size, build-quality, sound-quality, sleek design and features make it one of the best portable speakers for this price. I’ve only used the speaker for about 3 weeks, so I will update this post if I run into any issues later on. For example, one person wrote on Amazon that the battery stopped holding a charge after several months. It could have been a defective unit because I didn’t read any other similar reviews, but I’ll check the claim out myself too. Enjoy!